If you are the owner of an ecommerce store that is built on the Magento platform, then you must have already heard that the company is ending support for Magento 1 in June 2020. And it is a necessity to migrate your web store from Magento 1 to Magento 2 before the big change. It must seem like it’s away in the future and you have the leisure to pursue this matter later but understanding the migration process, choosing a Magento migration service provider, etc can take a few months. But worry not, we are going to guide you through the whole process in this article. It will tell you why you should migrate, the difficulty of the migration process, how to migrate and finally, the benefits of migrating to Magento 2. The major difference between Magento 1 and Magento 2 we have highlighted in this article is the ability to run PWA (Progressive Web Applications) in Magento 2. And we assure you that this feature is worth all the trouble. Let’s start with the problems you might face if you don’t migrate your web store to the latest version of Magento. Regular updates in software make sure that all security threats are addressed to keep your site safe from cyber attacks. The updates keep everything running smoothly making sure that there are no data leaks or malfunctions of these sorts. And as an ecommerce site, the data you have is extremely sensitive because it is your users’ personal data. And loosing that data could cause a catastrophe for your business. Additionally, if the users feel that their data is in danger, they might not feel safe sharing their personal information with your business. Indirectly, you could lose a major chunk of your business. And I am sure no business owner wants that. Migrating to a newer, better version of Magento will continue protecting your site against all these threats. But it isn’t just about threats. There is more to this migration process. But migrating from Magento 1 to Magento 2 will not be easy. The first thing to note is that it will be more expensive than Magento 1. It will also take a few months for a Magento 2 development company that provides Magento 2 migration service to transfer everything to the new platform. Also, the themes that you used for Magento 1 will not work for Magento 2. So, you will have to build or purchase new themes. The same goes for the extensions. Because the themes and extension data cannot be migrated, you will have to build them from scratch. These are the possible difficulties that you might face after taking the decision of migrating your store to Magento 2. But after reading the next section of our article, your frown would be turning into a smile. Why should you migrate to a new platform though? Magento 1 is familiar ground and migrating is a hassle. So, what do you get out of migrating? The new things that Magento 2 has to offer are worth this hassle. After migrating to Magento 2, you will be able to integrate Artificial Intelligence in your Marketing and Sales strategies and target your audience more effectively. You can use chatbots to automate your customer service saving the resources, efforts and the time of your Sales and Support team. Feature-wise Magento 2 brings with it more speed, added security, increased SEO friendliness and an easier to navigate dashboard. And the most talked about feature that Magento 2.3 will offer is PWA (Progressive Web App), which means you can provide a mobile app like an experience of your webstore to your customer without actually having a mobile app. You won’t have to invest a big sum of money in developing a mobile app but you will be providing a necessary mobile app feature to your customer base. However, that is not it. Using PWA feature, the customers will be able to add a shortcut of your web store (mobile experience) on the home screen which will enhance your customer life cycle. Additionally, PWA also have push notifications, just like apps. Mobile app like features without actually having to put the efforts in developing one. Amazing, isn’t it? 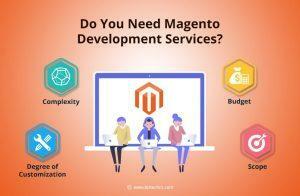 It is a long, cumbersome process, and if you own an ecommerce store that is built on Magento 1, migrating to Magento 2 should be your priority. It will save your store from a lot of avoidable issues, and give it a revamp that can elevate the customer experience on your store.